But it’s not a player. Announcer Johnny Doskow will be announcing some Oakland A’s games in place of Ken Korach, who is recovering from surgery, reports Sac Biz Journal. 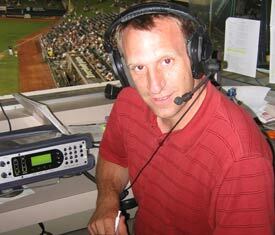 Doskow is excited about the opportunity to announce games for a major league team. He said he â€œlost itâ€ when he found out he might be asked to announce games for the Aâ€™s in Boston. Go Johnny. Speaking of which, who’s up for some River Cats baseball?! I know I am. The season gets underway next week of course, with the home opener coming Friday the 13th against Reno. But before all that, the Cats will host the A’s on Saturday, after Oakland returns from the MLB exhibition series in Japan. It’s the first time in 5 years Raley Field has hosted major league baseball.